The campaign kicked off in Grand Rapids, Mich., with a press conference in September celebrating release of the Clean Jobs Midwest report. The event featured local representatives and business people highlighting the local economic impact the renewable industries have on Grand Rapids. This included Alison Waske Sutter, sustainability manager for the city, Ken Zebara, territory manager for Harvest Energy Solutions; Albert Jongewaard, public affairs manager for Apex Clean Energy; and Brad Pnazek, senior development manager for Tradewind Energy. By highlighting voices from the community, we were able to localize the report, attracting coverage by several local news outlets. At the next event in Bedford, Va.,, economic development, legislative, and business leaders, joined together for a tour of a 3-megawatt Bedford Solar Farm currently under construction. Virginia State Senator Steve Newman, Bedford Mayor Rob Wandrei, and the President and CEO of the Bedford Chamber of Commerce Susan Martin were in among the local notables in attendance. This project, developed by O2 EMC, is located next to an unused brownfield site, and will eventually provide enough power more than 500 homes. The event generated significant local press coverage, including both local broadcast and print. The campaign’s third event highlighted the solar industry growing in a state known for wind power – Iowa. 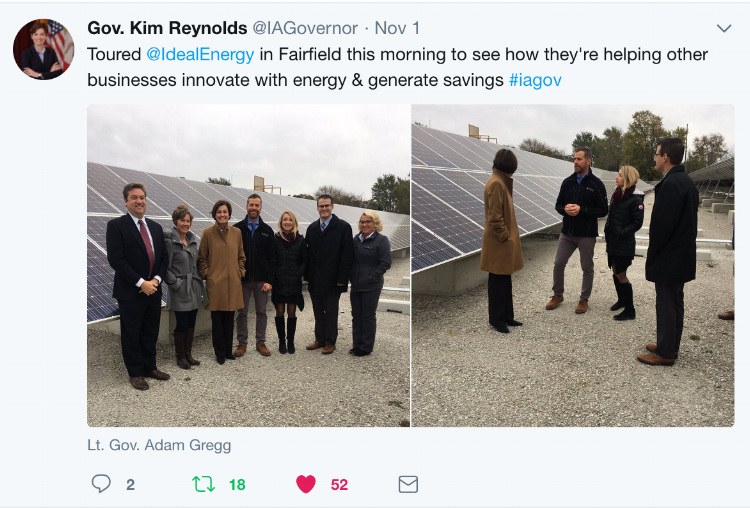 Solar jobs grew by 15% in the state from 2015 to 2016, and companies like Ideal Energy, based in Fairfield, are helping lead the way. That’s why Iowa Gov. Kim Reynolds and Lieutenant Governor Adam Gregg joined Ideal Energy on a tour of one of their installations, at Schaus-Vorhies Manufacturing in Fairfield. The Governor and Lt. Governor got to see firsthand how these growing companies are employing Iowans and using solar to reduce costs. The campaign’s most recent event was held in Cleveland, at Talan Products, a metal stamping company that supplies the solar industry. Talan employs 80 workers and is one of the fastest growing inner-city businesses in the nation. 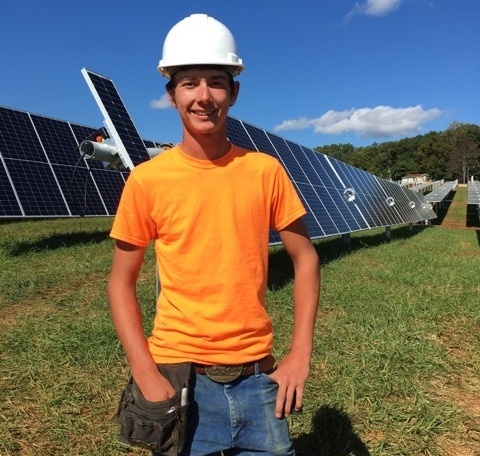 One-third of Talan’s business is with the solar industry, and it’s growing. The company may add another 20 employees in the coming year to accommodate additional orders. U.S. Rep. David Joyce (OH-14) and State Rep. Dave Greenspan toured the facility with Talan’s CEO and the CEO of Wire-Net, an association of Ohio manufacturers that includes wind supply chain companies. For both wind and solar, the jobs story reaches all the way up the supply chain. This is just the start for the Renewable Energy Jobs Tour. By showing the public, media, and elected officials the positive impact renewable energy is having in their neighborhoods, the campaign is demonstrating that these technologies are delivering the job creation that our country needs. And at a time when policies that support renewable energy are under attack, it is more important than ever that these stories reach these key audiences. To host an event, or follow the upcoming events, please visit www.arenewableamerica.org. Wind and solar are just part of the $200 billion advanced energy industry, which supports more than 3 million U.S. jobs. Learn all about it in the Advanced Energy Now 2017 Market Report.